Hi, I'm a Drupal developer and I build websites. I like this module, that module, and those modules. I click this checkbox, tweak that setting, and set those variable. When does this stop being fun, aren't you sick of repeating these same arduous tasks for every site you build? 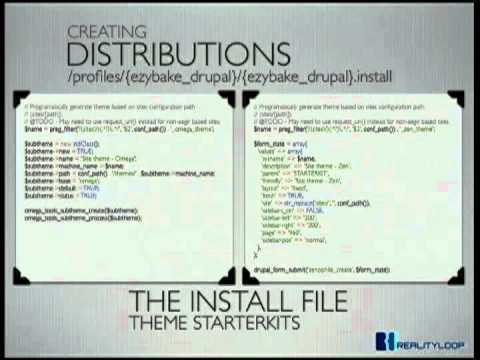 Meet Distributions, not a new concept at all but one that will save you time and let you get on with the better things in Drupal. A new site ready to go in a matter of minutes. Stuart's presentation was second to none at the conference and he really did a great job convincing me to start creating and using distributions. Introduced me to some very powerful site building concepts and tools - much appreciated and well done. I was especially impressed that you supplied not only your slides but your recipe as well! DRUSH MAKE - well done! I enjoyed this presentation as a non-developer, I got a good sense of the purpose of the functionality and the methodology required. Well delivered, thanks! Can we get link to slides? or at least the first make stub file? The link you referenced for the Stub Makefile is correct, that is all a stub make file needs, that small amount of data. Excellent session. Very knowledgeable, well structured presentation that was focused, practical and highly relevant. Great work!